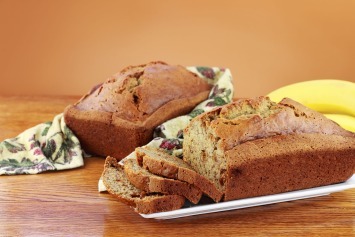 This is a moist and delicious low fat banana bread recipe. Personally, I would use full fat butter in this recipe, but I include the low fat version here because I know many of you want the true low fat recipe. Combine the sugar and butter and beat well. Add the mashed bananas and beat well. Mix the dry ingredients together and add to the banana mixture. Add the walnuts and mix it all together well. Spray a loaf pan with the no fat cooking spray and pour the batter into the prepared pan. Bake at 350°F for 55 minutes. The banana loaf may need a few extra minutes so check it by inserting a toothpick in it before removing it from the oven. This low fat banana bread recipe makes one loaf. If you are a beginner baker, here’s a simple tip that will prove valuable during your baking “career”. To test a cake or quick bread batter like this one to make sure it is fully baked, insert a toothpick or a thin metal skewer into a thick part of the cake. If it comes out clean, the cake is baked. If it still has batter stuck to it, let the cake bake for a few more minutes and test it again. It is a sure fire way to make sure the cake is fully baked. Making banana bread is not only a great way to use up over ripe bananas, it’s also a great way to get more fruit into your children’s diet. The best way to keep very ripe bananas until you are ready to bake up a batch of delicious banana loaf is to freeze them right in their skins. When you are ready to bake, simply take the bananas out of the freezer, peel them, place them in a bowl and allow them to thaw. You will have bananas ready to make into delicious breads and muffins any time. If you like this recipe, I’d love you to Pin it to Pinterest, Tweet about it, Like it on Facebook and leave your own great recipes below. If you love this low fat banana bread recipe look here for our low fat apple walnut muffins.